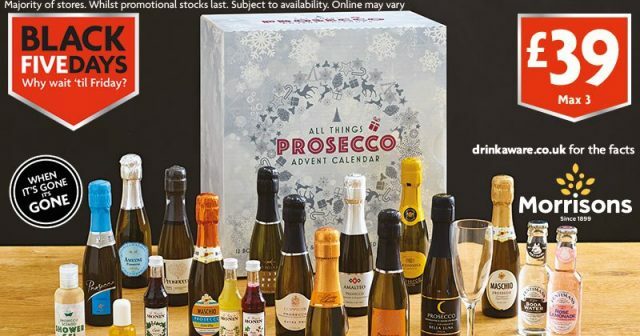 Morrisons has launched Black Five Days, with booze deals aplenty, including a limited edition ‘all things Prosecco’ advent calendar for £39. Limited to three per customer, it features 12 mini 200ml bottles of Prosecco, including Mionetto, ‘I heart Prosecco’ and Menestrello, along with 12 Prosecco-inspired novelties from bath fizzes, shower gels and fruity syrups. It is also offering a Prosecco Magnum costing £10 – one of the cheapest magnums around. However if Prosecco isn’t your thing, there’s a beer advent calendar comprising 24 bottles for £30, or one for the gin connoisseur, featuring both the classics and the quirky, from Bombay Sapphire to rhubarb fro £54. At the other end of the spectrum, giant bottles are also on offer, including a 1.75L bottle of Boodles gin for £40, or a giant bottle of Hendricks for £60.